Zenith Nutrition Calcium + Magnesium + Vitamin D form a powerful combination that promotes healthy teeth and bones. They also work synergistically to provide additional significant health benefits. 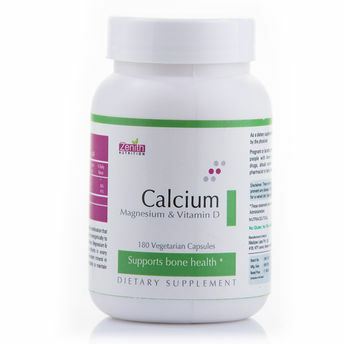 This dietary supplement offers optimal amounts of these nutrients in every convenient daily serving to maintain healthy bone mass and help maintain favourable Calcium levels in the body. Magnesium in it promotes relaxation, supports nerve conduction and helps induce restful sleep. It also assists in the purification of body tissue and enhances energy levels. Helps maintain healthy teeth and bone mass. Promotes relaxation, supports nerve conduction and helps induce restful sleep. Assists in the purification of body tissue and enhances energy levels. 100% vegetarian and gluten-free capsules. Explore the entire range of Multivitamins available on Nykaa. Shop more Zenith Nutrition products here.You can browse through the complete world of Zenith Nutrition Multivitamins .Alternatively, you can also find many more products from the Zenith Nutrition Calcium + Magnesium + Vitamin D Capsules range.